We took our first overnight bus from Salta to La Quaica, that left the bus station at 12:30 and arrived at the Argentinian border at around eight in the morning. Sarah tried a sleeping pill, which can be easily bought over the counter at any Argentinian pharmacy. After hopping of the bus in La Quaica, we caught a quick taxi to the border and crossed with relative ease. We've heard stories from other travelers who have been stuck at that border for multiple days due to strikes and large bribes. At the Bolivian bus terminal, we met a young local guy called Christian who spoke a bit of English and was able to help us find the right bus. We taught him some English and he taught us some Spanish. We caught a dusty rickety local bus for 10 hours, sharing the ride with baby goats, and puppies. We almost missed getting back on the bus, after visiting the toilets in a little Bolivian mountain town. We ran after the bus which had started to leave with all of our belongings! Most of the time the bus traveled about 50 km/h over dirt roads reminiscent of Christchurch. The bus stopped at odd points in the middle of the trip to let school children and old ladies on board to sell their wares. 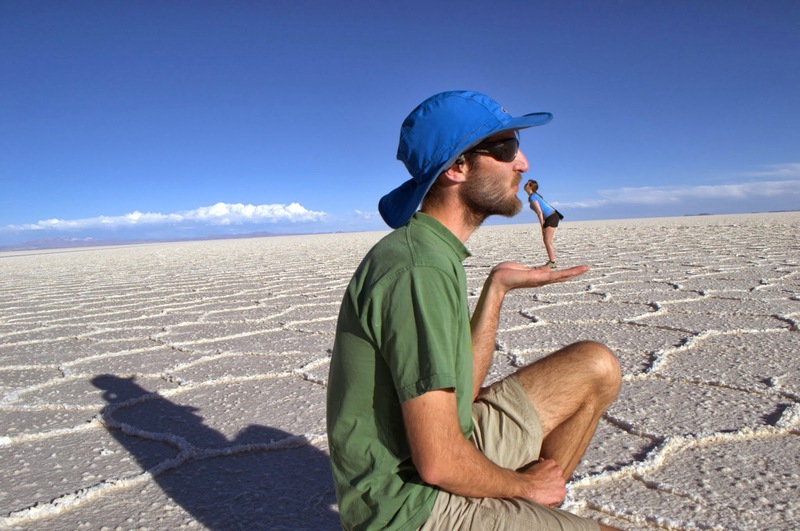 Uyuni has quite a significant altitude. Wide gravel streets, sloooow internet and large temperature changes. We both got dizzy walking up a few flights of stairs. Next we had a guided tour of the Salar de Uyuni (Salt Flats). We went with Red Planet Adventures, with an English speaking guide. First stop was the train graveyard. Full of trains used for mineral transportation, mainly salt and silver. There were tons and tons of steel but the transportation cost was so great that they just dumped all these trains in the desert. People have come out to scavenge steel off the trains to sell and use. Salt production - piles and piles of it $2 each. The locals come out and subdivide the salt like an archaeology dig site and make pile up the salt to dry. They return in the afternoon or the following day to shovel it into a truck and take it into town where it can fetch as much as $5 per pile. The salt flat was massive, in the order of 200 km by 100 km. Surrounded by nothing but white salt! Other than pure NaCl they also have factories to extract other minerals from the brine beneath the salt crust, namely Lithium. We had lunch beside the salt flats at a town at the base of a volcano. There we saw llama, (white) pink flamingo. As with most small villages everything was hand made on site, there must have been a new building in the works as we saw lots of bricks baking in the sun. After lunch we were driving towards a volcanic island in the middle of the salt flats. Our driver/guide stopped in the vast expanse, quite seriously in the middle of nowhere to take "perspective shots". Turns out he was an awesome director/cinematographer as well as being our guide. After playing around with cameras we finally made it to the oddly placed island. Most of the island was actually petrified coral. Lots of very old cacti. Cactus grow about 5cm a year. Some were more than 1000 years old! Beside the island there was a modelling runway constructed entirely of salt bricks. To finish the action packed day we went to a very wet part of the salt flat, donned some gumboots and watched the sunset. We made it back into town with just minutes to spare - we had our second night bus booked to take us to Bolivia's capital La Paz. I like the picture of Big Brian kissing Little Sarah! Cute! I've enjoyed reading about your adventures!